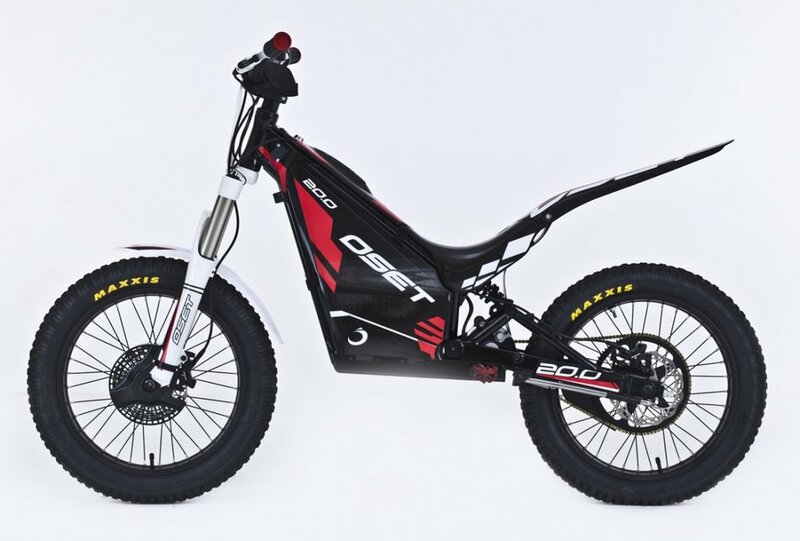 The 20.0 was the first bike designed of the new beginning for Oset. It had a makeover for 2015 with the addition of side panels, making it fit in nicely with the rest of the new range. For 2018 the “Eco” benefitted from new graphics, a padded chain guard, stronger forged chain adjusters, strengthened frame, repostioned controller and relay and a longer shock giving 15mm further suspension travel. All of which make the new Oset range perform at the highest level yet in terms of ride quality and durability. Why change what is already working so well? The 2019 machines across the Oset range remain as per the 2018 spec. The 3 dial adjustment system is introduced with incremental and individual adjustment, to the 1200 watt motor, of power, speed and response. All of which can be set from 0 to 100% meaning that the power delivery can go from docile and under walking pace right up to full speed and popping wheelies! Air/spring front suspension includes rebound adjustment. Coupled with a preload and rebound adjustable rear shock absorber. (different spring rates are also available to finely tune the bike to the rider’s weight). Hydraulic disc brakes give even the smallest of hands strong and responsive stopping power. A strong steel frame and swingarm make this bike a tough cookie and star of the “storm the embassy” youtube hit. Aimed for riders from 8+ with a heavy weight spring provided as an accessory even Dad can have a go! Suspension: front telescopic air/spring, rebound adjustable, Rear preload/rebound adjustable oil damped. Brakes: Front & Rear Hydraulic 160mm Disc brakes. Controller: 48v, adjustable for speed, response and power.